Betty White: "I Am the Luckiest Old Broad on 2 Feet"
"I am the luckiest old broad on two feet," Betty White told Ann Curry on the "Today" show Tuesday. Betty White is awfully good at playing innocent, even when she's got a mischievous gleam in her eye. Television's busiest 90-year-old chatted with Ann Curry on the "Today" show Tuesday about her pair of TV shows and her upcoming Friar's Club roast and sounded appropriately nonplussed by the longevity of her success. "I am the luckiest old broad on two feet, trust me! I love what I do. I'm blessed with good health and great energy, so what's to say no to? Well — I know what's to say no to!" she admitted. "Well, I used to," White admitted. After spending the first part of her golden years starring as the ditzy Rose in "The Golden Girls," White now stars in the TV Land sitcom "Hot in Cleveland" and is an executive producer of "Betty White's Off Their Rockers," a "Candid Camera"-style reality show about elderly people pranking kids. "I'm the innocent executive producer," she said of that show. "It's silly; it's terribly silly… It's a case of getting a chance to turn the table on some of the youngsters who usually get the last word and stuff, and it's surprising how people love to get involved in that." Lovable Betty White recently celebrated her 90th birthday but she is giving no indication of interest in retiring. 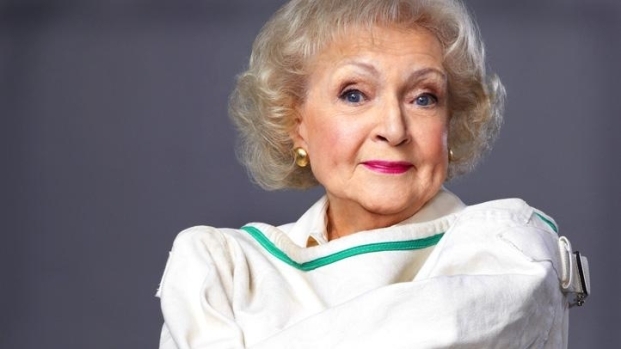 She tells us about her new NBC television comedy "Betty White's Off Their Rockers," a hidden camera series premiering on Wednesday, April 4 at 8/7c. White wasn't quite as breezy about her Friar's Club roast Wednesday night. "Now that I'm scared about. I have no idea what's gonna happen," White said. Curry warned her she might hear a lot of four-letter words at the event — and might want to cover her ears. "The good part of it is I won't understand any of it," White said sweetly. On top of those TV shows and the roast, Curry asked, was there anything White had left to check off her bucket list? "I'd love to go…" she began, then corrected herself. "No. No. I mean — nothing I can talk about!" she corrected.